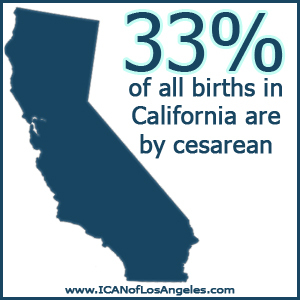 ICAN and ICAN of Los Angeles are proud to help improve maternal-child health by preventing unnecessary cesareans through education, providing support for cesarean recovery, and promoting Vaginal Birth After Cesarean (VBAC). ICAN and ICAN of Los Angeles envision a healthy reduction of the cesarean rate driven by women making evidence-based, risk-appropriate childbirth decisions. 1. The inappropriate over use of cesarean surgery is jeopardizing the lives of mothers and babies. 2. When a cesarean is necessary, it can be a lifesaving technique for both mother and baby, and worth the risks involved. 3. Birth is a normal physiological process. Research shows that with emotional support, education, and an honest opportunity, the vast majority of women can have a healthy vaginal birth. 4. A healthy birth incorporates emotional, physical, and spiritual well-being. 5. Research shows that VBAC is reasonable and safe for both mother and baby. A repeat cesarean should never be considered routine– it is major abdominal surgery with many risks. 6. It is unethical and unenforceable for hospitals to institute VBAC bans. Women have the right to refuse any procedure, including a cesarean. 7. Women have the right to true informed consent and refusal, which entails full knowledge of the risks and benefits of all tests, drugs, and procedures. 8. It is incumbent upon every care provider and institution to facilitate the informed consent process. 9. Women must be allowed to express all their birth related feelings in a safe and supportive environment. The emotions of a pregnant and birthing woman have profound effects on the birth outcome and recovery. 10. It is unethical for a physician to recommend and/or perform non-medically indicated cesareans (elective). Women are not being fully informed of the risks of this option in childbirth, and therefore make decisions based on cultural myth and fear surrounding childbirth. 11. The trend of “elective cesareans” is being significantly overstated through distortion of research and data. 12. We as women must now assume more responsibility for our own births. 13. It is critical that women’s choice of care provider and location of birth is respected. International Cesarean Awareness Network, Inc. (“ICAN”) maintains this website as an online information and communications service. Use of this website is at your own risk. The information contained on or provided through this website is intended for general consumer understanding and education only, is not intended to be, and is not provided as a substitute for professional medical advice. Nothing contained on or provided through the website is intended to be or is to be used for medical diagnosis or treatment. The website is presented by ICAN for the sole purpose of disseminating general health information for public benefit. Always seek the advice of your midwife, physician, nurse or other qualified health care provider before you undergo any treatment or for answers to any questions you may have regarding a medical condition. The website and any information provided on the website are not intended to constitute the practice of or furnishing of medical, nursing, or professional health care advice, diagnosis, consultation or treatment or services in any jurisdiction. Except for information, products, services or merchandise clearly identified as being supplied by ICAN, ICAN does not operate, control, supply, endorse, warrant or guarantee any information, products, services or merchandise available on the website or through the Internet generally in any way. You understand and agree that ICAN does not make any express or implied warranties, representations or endorsements of any kind whatsoever (including without limitation, warranties of title or non-infringement or any warranties of merchantability or fitness for a particular purpose) with regard to the website, or with respect to any information, products, services, merchandise or other material provided on or through the website. ICAN does not warrant or guarantee the accuracy, completeness, correctness, timeliness, or usefulness of any information, products, services, merchandise or other material provided through the website. ICAN makes no warranty or guarantee that the website will be uninterrupted, timely, secure, or error free. In no event will ICAN be liable to you or anyone else for any decision made or action taken by you or anyone else in reliance upon the information contained on or provided through the website. I would love to get more details on your meeting next week. I have a mama with a due date for Saturday and her Dr wants to sign her up to have a cold birth. She has already Vbac’ed once and she just needs more support of ppl telling her that she has the right to TOL til her 42nd week of gestation. Please help me with any information you have.